Thornton re-signed Friday with the Wings. Thornton was one of three re-signings announced by Dallas on the first day of free agency, with forward Glory Johnson and center Cayla George also sticking around with the Wings for another season. A 6-foot-1 wing, Johnson started in 32 of her 34 appearances for Dallas in 2018, averaging career highs in points (9.2 per game), rebounds (4.0), assists (1.8), three-pointers (1.3) and minutes (28.6). Thornton registered eight points (4-7 FG, 0-2 3Pt) and three rebounds in the Wings' 101-83 loss at Phoenix on Tuesday. This was a pretty average game for the former UTEP standout, as he only managed eight points by shooting 57.1 percent across seven field-goal attempts while grabbing just three rebounds. Thornton wrapped up her third WNBA season adding career highs in points, rebounds and assists with 9.2, 4.0 and 1.8 per contest, respectively. Thornton scored 15 points (6-11 FG, 3-5 3PT) in Tuesday's loss to the Sun. While the Wings were blown out on the road, Thronton was one of four players in double-figures, and she chipped in three rebounds, two assists and a block in 32 minutes of action. Thornton had 11 points (4-11 FG, 1-5 3Pt, 2-2 FT), three rebounds and three assists during the Wings' 92-75 loss against Connecticut on Sunday. Sunday's outing marked the fifth straight game in which Thornton has scored in double figures, as she accomplished the feat despite shooting just 36.4 percent from the field and an one-of-five mark at the three-point line. Through 25 games played so far in 2018, the third-year forward is averaging 9.1 points and 4.4 rebounds per contests, both of which are career-highs. Thornton amassed six points (2-6 FG, 0-3 3Pt, 2-2 FT), six rebounds, two assists and one steal during the Wings' 92-77 road win at Los Angeles on Thursday. Despite her superb rebounding Thursday, Thornton struggled overall from the field, shooting just 33.3 percent while missing all three of her three-point tries. Currently, the 26-year-old has started every game this year and she is averaging 8.1 points, 4.5 rebounds and 1.1 steals per outing. Thornton produced seven points (2-4 FG, 1-1 3Pt, 2-2 FT), one rebound and one assist during the 97-87 road win over the Liberty on Sunday. Making her 16th start of the year, Thornton managed to reach the seven-point mark while shooting the ball superbly from the field and at the free-throw line. In her third season, the 26-year-old is so far averaging career highs in points, rebounds and assists with 8.2, 4.5 and 1.9 respectively. Thornton recorded 11 points (5-9 FG, 1-3 3Pt), four assists, three rebounds and one steal during Sunday's 76-72 loss against the visiting Lynx. Thornton had a decent performance Sunday by dropping 11 points on 55.6 percent shooting including hitting a three-poitn shot. The 26-year-old is so far posting career highs in just about every statistical category in her third WNBA season. Thornton had 12 points (3-9 FG, 2-3 3Pt, 4-4 FT), eight rebounds, one assist and one block during the Wings' 75-72 loss to the Mercury on Tuesday. Thornton shot just 33.3 percent from the floor overall but did however managed an efficient two-of-three outing from three-point range while knocking down all four of her free-throw attempts. Currently, the former UTEP standout is adding 8.8 points, 5.3 rebounds and 1.9 assists across eight games played. Thornton missed her only field-goal attempt (0-1 FG), but provided two rebounds and one assist during Friday's 86-78 season-opening loss at Phoenix. Thornton also had four personal fouls in just nine minutes as she was non-factor Friday. The 25-year-old should bounce back soon though as the Wings' next game is Sunday against the Dream. Thornton finished with two points (1-3 FG, 0-2 3Pt), six rebounds, two assists, two blocks and two steals during Sunday's 68-55 preseason win over Las Vegas. Thornton got the start at the power forward position and even though she wasn't a factor offensively, she added many other statistical contributions during the win Sunday. The 25-year-old was primarily used off the bench last season and averaged 6.8 points and 3.3 rebounds. It's likely that Thornton will be used similarly in 2018. 2015: Signed to a training camp contract with the Washington Mystics. Waived by the Mystics on July 16. 2017: Signed to a training camp contact to the Dallas Wings on April 6. Played in all 34 games… Started in one game… Averaged 6.8 points, 3.3 rebounds, and 17.2 minutes per game… Broke her own career high in points four times this season… The latest was on 8/23 with 15… Set a new career high in total rebounds with nine, and a new career high in defensive boards with seven… Set a new career high in free throws made with three… Played in her first playoff game on 9/6 against the Washington Mystics. 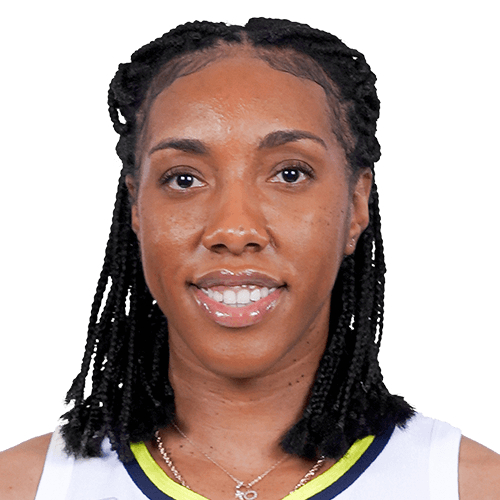 Played in the WNBA in 2015 with the Washington Mystics for 10 games, where she averaged 2.2 points and 2.1 rebounds per game. Garnered placement on the All Conference USA second team and was a C-USA All-Tournament team member as well…. Among C-USA leaders for FG% (fifth), offensive rebounds (seventh), rebounding (10th) and scoring (22nd) … Started every game she played in (32), only missing the regular-season finale. Daughter of Lewis and Merteen Thornton … has two brothers … degree in criminal justice … enjoys studying and being in the gym playing basketball in her spare time … pre-game ritual includes praying … lists Candace Parker as her favorite basketball player … born in Germany due to her parents serving overseas in the military… Four-year standout at Irvin High School … Graduated as the school’s career record holder for points (1,953) while also amassing 884 rebounds… Number two scorer in the state among Texas 4A players … Texas Girls Coaches Association all-state and all-star game honoree … Was a standout in track & field, and claimed the district title in the 100-meter hurdles, long jump and triple jump while securing second place in the 100-meter dash.